OzShut Roller Shutters “Heavy Duty” Side Rail Option Upgrade! OzShut Roller Shutters “Heavy Duty” Side Rail Now Available! 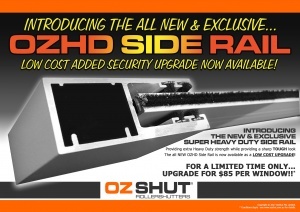 OzShut now makes available the most advanced enhancement for Security to your home with its new and EXCLUSIVE OzShut Roller Shutters “Heavy Duty” side rail. Made of the same high quality marine grade aluminium as our standard side rail, the upgraded “Heavy Duty” version is deeper, wider and stronger than the competition. Front security lip boasting a 5mm nominal thickness! Are you concerned about the security of your home and family? Home Invasions are becoming a very real threat to the security of our homes and families. Are you protected? Don’t become a statistic! You can have total peace of mind knowing that protecting your windows and doorways from attack, will stop burglars in their tracks! Protect your treasured family belongings from burglars! Reduce your Insurance Premiums with confidence! Go on holidays knowing you will not come home to total despair! OzShut Roller Shutters now offers this upgrade option to further enhance the safety of your home. For a limited time only, upgrade to the “Heavy Duty” side rail option for only $85 per roller shutter. This upgrade is only available with automated electric roller shutters.